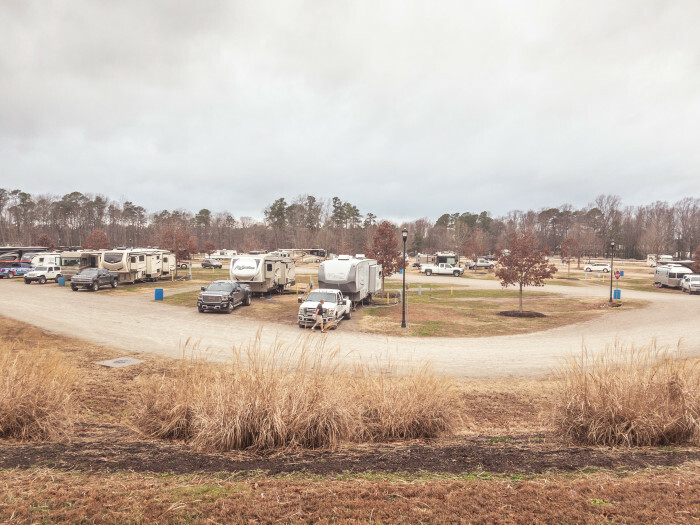 Ask fellow campers about "North Carolina State Fairgrounds Campground" and nearby attractions. Site was level, park is quiet except for trains a few blocks over at night. Full-time security met us at our selected site within a few minutes of our call to them. We parked our tow trailer on our site beside our motorhome. Signs are well placed to guide to park from Blue Ridge Road and Trinity Road. Close to downtown Raleigh, NC State Univ, Museum of Art, weekend flea market at Fairgrounds. 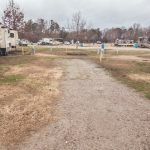 We camped at North Carolina State Fairgrounds Campground in a Motorhome. The Museum of Art has outdoor trails with sculptures - great place to walk. There was a horse show event the weekend that we were here, and spectators could attend for free. Nearby Maytag Coin laundry is huge, clean and reasonably priced. No reservations. A little difficult to find the right gate. Once we found the entrance, access was easy. Called security to check in, which was quick and easy. I didn't see any shower or other facilities dedicated to campground. Site utilities were well placed and adequate. Nice campground if you have activities in Raleigh area, or are there for fairground functions. We camped at North Carolina State Fairgrounds Campground in a Travel Trailer. Stayed in main designated camping area. Most sites look fine, but a few are quite unlevel and a few look like they would be swampy in rainy conditions. Trees are too small to cause problems for roof-mounted sat TV. Strong local TV channels came in without needing to crank the antenna up. Trash barrels every other site (or so). Entrance is between Gate 6 and Gate 8 (opposite side of the street from the gates). Trains can be noisy, but didn't hear any overnight. We camped at North Carolina State Fairgrounds Campground in a Motorhome. Nearby Pam's Farmhouse is a local favorite for breakfast and lunch. Vic's Italian is in the city's historic center and is fantastic. They have also opened another location near the campground in a modern shopping area. My first stay so I wanted to clarify some things I learned in addition to the reviews. There are actually two locations for camping at the fairgrounds. The first is an established campground holding about 100 rigs in a traditional road arrangement. As mentioned there are no bathrooms or picnic tables provided. this is behind the horse arena. The second is an area around the perimeter of the fairgrounds. This borders the fence surrounding, from what I could tell, almost the entire property. There appears to be about 250 sites in this area, usually two rows of camper with a road between. All these are described as having 50 amp, water and sewer. One contributor said there were showers inside the gate, this maybe the area where they are available. It seems the area around the perimeter is favored by those attending shows at the facility, a dog show was going on during our visit. It is an interesting time to visit during a home NC State football game. Well behaved crowd but 50,000 people parking in your yard. Traffic that day requires planning on your part. Finally, the method to register is: select an available site but prior to setting up, call the phone number posted on the entrance signs, wait for security to arrive and check you in and take payment. Check the site carefully that it is not “bad ordered” with a plastic bag over the power pedestal. We camped at North Carolina State Fairgrounds Campground in a Travel Trailer. Very nice, clean park with full hookups, good WiFi and some OTA channels available. Near NC State College. Great staff. No it's not a "resort", but we found it suited our needs very well. Would not hesitate to stay again. Had no problem finding the park, employee gave me the physical address and was very helpful. We camped at North Carolina State Fairgrounds Campground in a Fifth Wheel. This campground has full hookups with 50 amps. Sites and roads are gravel, so it can get a bit dusty. Sites are level and a fair amount of space between each site. Roads are big rig friendly. The location is close to NC State University and downtown Raleigh. I wold stay here again. We camped at North Carolina State Fairgrounds Campground in a Motorhome. Big rig Friendly. Easy access in and out if you call or directions. DO NOT use your GPS. Gravel roads and gravel sites. Sites were level and spacious. Very quite. We FT in our MH and we do not use the park amenities so a safe place like this fair ground works great for us. We camped at North Carolina State Fairgrounds Campground in a Motorhome. We stayed here 4 nights for the Bluegrass music awards show. Not easy to find but we got lucky and when my wife called to see where it was we were parked by a huge facility and the security guy was right behind us so he just led us to the park and checked us in. Very nice guy. As others have said it is behind the horse facility but you have to look closely for the campground sign as it is very small and we drove right buy it as it is on a sign with other wording about the horse facility. Nice level site with good utilities and open sky to get a satellite shot. Very busy city but we had no problem finding parking downtown. We would definitely stay here again if back in the area. We camped at North Carolina State Fairgrounds Campground in a Fifth Wheel. This is a large parking area (a few thru the fair grounds) with full hook ups. No cable but the over the air channels come in ok. Open so Dish worked well. Grassy with gravel not so level sites. Nicely landscaped for a fair show grounds. The horse complex is attached so interesting to go see what is going on and there is often something at the facility. It is closed for the entire month of October though for the fair carney guys. You just come in and find a hookup and then call a number to pay or they will find you at some point. You cannot reserve a spot. Plenty of spaces though even at a big horse show there were still plenty of openings. Easy to navigate and a dump station as well if you wanted to not hook up and just park in the horse lot over night. Easy on and off the highway near 440 and wade avenue (1). Plenty of stuff to do in the area. It is at the NC State arena though so football season and sat was interesting. Lots of people camp out Friday night and Saturday. Verizon works well and they have a wifi that is ok at best. We camped at North Carolina State Fairgrounds Campground in a Fifth Wheel. 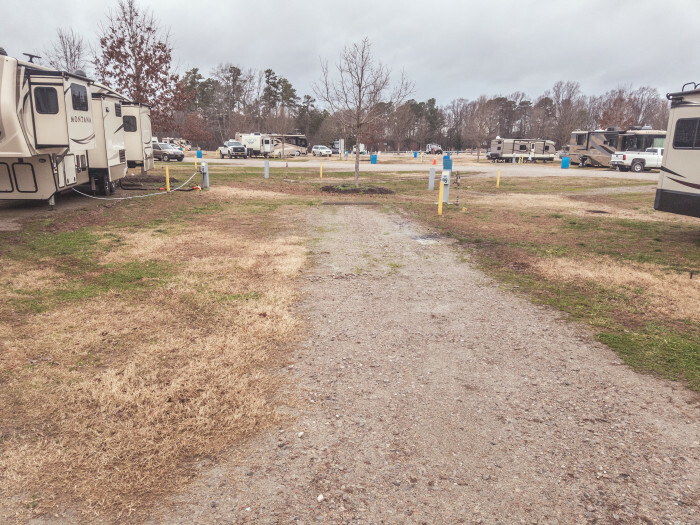 This parking-lot-style campground has spacious 3 way sites for only $30 a night. Very quiet and nice landscaping. Good wifi. Not THAT hard to find, just follow the directions on the website. 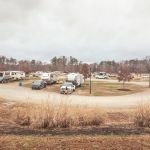 We camped at North Carolina State Fairgrounds Campground in a Fifth Wheel. Food Lion is less than two miles away. This is our second stay here; we were here last June as well. Price hasn't changed, so good value for a nightly rate (downside is that there is no discount if you stay weekly/monthly, so $900/month isn't a great deal). Security guards are super nice. We were here a month this time, and one of the security guys loaned us a weed eater because the landscape crew won't get right around the rig (liability issue). There was a horse show one weekend, and I will stay during a show again. For the most part, dogs were allowed to run around unleashed and the amount of dog poop left everywhere was disgusting. Thankfully the landscape crew did a great job of cleaning after the horse trailers were all gone. So it's convenient for everything we need, but don't expect more than a grass/gravel parking lot. It's no frills, but we'd stay again if in the area. We camped at North Carolina State Fairgrounds Campground in a Fifth Wheel. Very convenient to everything in Raleigh. We have stayed here many, many times. Nothing fancy but a quiet full hookup spot that is not in a parking lot as many fairground spots are around the country. There are a few different sections with the one behind the horse barns being the newest. Bathrooms and showers are inside the fairground area. We camped at North Carolina State Fairgrounds Campground in a Motorhome. A good no frills place to stay while attending special events at the fair grounds or the horse arena. Helpful staff. Open space for satellite reception. Adequate wifi. Pleasant stay while we toured the Raleigh area. We camped at North Carolina State Fairgrounds Campground in a Motorhome. Level, clean, good wifi, good water pressure, easy in/out. Address is deceiving; look for the horse complex. Campground will be behind it. This is a no frills campground, No restrooms, no table, no fire ring. Full hook-up All back-in. No reservation taken. ( 200 sites ). We camped at North Carolina State Fairgrounds Campground in a Fifth Wheel. Check events at fair ground, Usually something going on there. The Park was a pleasant surprise. The RV campground is very basic, a full hook up on a gravel grass spot. Not a problem to get to or back into a spot. There are trees, but mostly open. It was quiet and nice for our stay at the horse show on the grounds. No bathrooms here at RV campsite, no fire ring or picnic tables. We camped at North Carolina State Fairgrounds Campground in a Motorhome. We were here for the horse show. Did drive into Raleigh to eat and meet relatives. Recommend Crabtree Mall for shopping. Also recommend driving down Hillsborough Street onto the NC State Campus for good nightlife & dining. It can be tricky to find if you're not familiar with the area. Look for Gate H7. Nice Harris Teeter less than 2 miles away. Convenient to Raleigh and Cary. Not too far away is an excellent pizza place called Pieology, and on the way back we saw and stopped at a Ben & Jerry's. Being in suburban Raleigh, there are many stores and entertainment fairly close-by. I lived in Raleigh 40 years so needed no guidance but did find that YELP was very accurate in my opinion regarding restaurants. Art museum is very close and downtown is a 15 minute drive except at rush hour. Anything to do with NC State Univ that is adjacent to NC Fairgrounds. NCS Football Stadium is 1000 yds from Campground. Excellent shopping is off any exit of I 44o Beltway around city of Raleigh. Campground is very hard to find in the dark of night, so arrive in daytime. From I 40 W get off exit #289/ Wade Ave and come to exit Edwards Mill Rd. Exit there South 2 miles to Trinity Ave. Left on Trinity Ave up the hill 2 miles to right turn on Youth Center Drive to Gate H7 into Campground entrance . We are here in a 42' MotorCoach w 4 slideouts. Plenty of room and well worth the effort to find it. Enjoy !!! The State Fair Campground is but a stone's throw from PNC Arena and NC State stadium, a perfect location for catching a concert or football game. Right next to State Fair Grounds. there is always something going on there at the weekends. Many excellent Mediterranean restaurants in the area...Google it. Huge malls nearby. Always check the fairgrounds calendar to see if there are any major events scheduled when you want to use a site. Normally there are plenty of unused sites except during state fair and on NC State football weekends. Lots to do in the area and events right on the fairgrounds. Are you affiliated with North Carolina State Fairgrounds Campground ?